HERE ARE SOME OF THE CITY'S MAIN BUILDING SITES AT THE MOMENT. The giant M&S store is beginning to take shape next to Corporation Street. They've already started putting up the huge glass curtain window which will look out over what's going to be Exchange Square. At the other end, near Market St and Cross Street, the building is covered in dense scaffolding. On Deansgate, just down from the Free Trade Hall, work continues on the job of converting the Great Northern Railway Goods Warehouse into a state of the art leisure complex to be named the Great Northern Experience. The tower on the right rises up over Peter St at the Deansgate corner. The picture bottom left is what I saw through a viewing window last October of the M&S building- I took six vertical wide angle shots and joined them all up to make a panorama. The tower of the Royal Exchange on the corner of Exchange St/St Mary's Gate should act as a point of reference. Next we see the Shambles being put back together again piece by piece- well that's the theory - not much is recognisable behind the PVC covering just yet, but you can just make out the horizontal and diagonal timbers of this medieval facade. The tower behind is the left-hand end of the Corn Exchange (or "Triangle" as the new owners have called it). Dickinson St is the street which leads off St Peters Square at the opposite corner from the Midland Crowne Plaza Hotel. This is an office block in the standard contemporary style - red brick, brown stone and curved bits on the top. Bottom right is a building rising up on Lower Mosley St across the street from the Midland and behind Peter House. Other construction projects in progress at the moment include the Printworks on Corporation St, the latest phase of the Bridgewater Bank residential complex, between Chepstow St and the Bridgewater Canal, and the Lowry, out in Salford Quays, due to open later this year. OLDHAM WAS 150 YEARS OLD ON SATURDAY, and there were many festivities to mark the occasion. Attractions included brass bands, other live music, street theatre and a fireworks display. Police officers posed as "Peelers", dressed in 150 year old uniforms from a local museum. An exhibition opened at the Art Gallery - "Boomtown- What Oldham gave to the world". During the nineteenth century, Oldham really was a boomtown - and the industry driving it all was cotton -cotton mills and factory workers' houses were being built at a frenzied pace. And many of thoses houses and mills are still with us today. Have a look at the website which has a taster of the exhibition and a superb panoramic photograph of Oldham taken around a hundred years ago. THE DAY BEFORETHE EURO CAME INTO USE IN 11 EU COUNTRIES, in Manchester there was a run on a much sought-after commodity: The Big Mac. To mark the 25th anniversary of the burger, McDonald's were offering two for the price of one. Yesterday I saw crowds of people forming long queues at various McDonald's restaurants around Manchester, including Oxford Road, Market Street, and the one in Oldham. Some customers were buying them in bulk and store managers reported sales levels of several times the normal amount. Eventually, the offer had to be suspended, because they'd underestimated the demand and ran out of burgers. 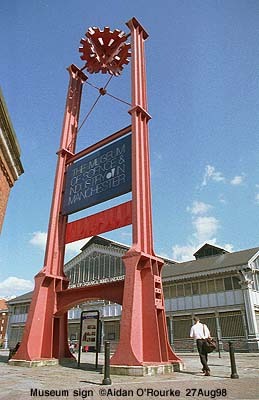 THE MUSEUM OF SCIENCE AND INDUSTRY IN MANCHESTER is to be doubled in size. Work will start in February and the extension will cost £14m. Funding comes from the EU, the Heritage Lottery Fund and the Department of Culture. The award-winning museum has come a very long way in the last quarter of a century. In the seventies, there were plans to house the museum in the unique warehouse building York House, which was demolished in 1975 to make way for a development which was never built. The Museum was first housed at the Oddfellows Hall on Grosvenor St, All Saints, before moving to its present site in Castlefield next to the Granada studios. DRINK DRIVING OFFENCES ARE DOWN in the Manchester area and in the country as a whole. The "Don't Drink and DrIvE" campaign (very clever that, I wish I'd thought of it), has had the desired effect. In Greater Mancherster over the festive period, only 50 drivers were found to be over the limit - down from 63 last year. Cheshire police breathalysed 627 drivers, but only five of them failed the test. The number of accidents in Greater Manchester causing injury was also down, from 450 last year to 401 since Dec 18. THE NEW YEAR HONOURS LIST included a number of people from the region, including an under-cover detective who received an OBE (Officer of the Order of the British Empire). His name is Henri Exton, and he retired from the Greater Manchester Police undercover unit five years ago. His remarkable career was featured on the front page of Thursday's MEN in an article by Steve Panter. His track record includes infiltrating a gang of violent soccer hooligans called "The Young Guv'nors" in the 1970's. At one point he was beaten by police who believed he was a genuine soccer thug. He also infiltrated drugs rings. Nice work if you can get it, but not for me. Other local people on the New Year Honours List include Tony Struthers, town planner and deputy chief executive at Salford City Council. It was he who masterminded the amazing transformation of the derelict Manchester Docks into Salford Quays. Performance poet Susan Andi, receives an OBE for her contribution to art in the Afro-Caribbean community. OBE's also go to champion of small businesses Stan Mendham. MBE's (Member of the Order of the British Empire) go to Paul Burdon, Michael Cohen, Marjorie Donnell and Barbara Goodman, all of Manchester, and Jack Abbott of Middleton. A FLU BUG HAS BEEN DOING THE ROUNDS, but so far it hasn't knocked on the door of Eyewitness in Manchester. People all over the country have been succumbing to the disease, and hospitals have been put under pressure, both from increased numbers of patients and decreased numbers of staff. They've done their best to cope, and credit is due to the hard-pressed NHS staff working under difficult conditions. Patients in Liverpool and Manchester have had to be taken to a hospital in the North East, as beds aren't available here. THERE ARE SERIOUS PROBLEMS IN THE AMBULANCE SERVICE in Greater Manchester, it has emerged. Just over a week ago, a 63 year old heart attack victim had to be taken to hospital in a fire engine. Despite five 999 calls over 45 minutes by her policeman son David Evans, an ambulance failed to arrive. DR HAROLD SHIPMAN appeared before Tameside magistrates, in Ashton, today and has once again been remanded in custody. He's accused of murder and forgery of a will, but pleads not guilty. ANOTHER CHILD HAS DIED as a consequence of the Boxing Day fire at a house in Gatley. Three year old Lisa Jane Harvey was rescued from the house, and taken to Booth Hall Childrens Hospital in north Manchester, but tragically, she died late last week. Her ten year old sister Zoe was also killed in the fire. Pregnant mother Julie Harvey, her husband Grahame and their 18-month old baby have been released from hospital. This terrible accident should be a warning to all of us - take care with fire. SURGEON DAVID BAUMBER HAS DIED OF CANCER. The doctor who worked in Bury had been under investigation in connection with the deaths of patients in his care. TWO FATAL ROAD ACCIDENTS HAVE OCCURRED IN CHESHIRE over the holiday period. A man was knocked down and killed in front of the Wizard Pub on Alderley Edge. He was at his son's wedding, and had walked backwards onto the main road when he was hit by a passing car. And Kevin Corran from Holmes Chapel was killed by a Ford Fiesta while walking along Chelford Road. THE NEW YEAR WAS WELCOMED IN peacefully by around 2000 people in Albert Square, but over in Piccadilly Gardens there were drunken scuffles and arrests. Earlier in the evening in Salford Quays, there was a family party, with a millennium mouse which ran up a gigantic flaming clock. The event, featuring Century 105 DJ's James H Reeve, Chris Best, Rob Charles and Clare Cridland, was free but only to families, i.e. adults accompanied by one or more children. Meanwhile in the Manchester Evening News Arena, (note the spanking new sign I noticed this afternoon) there was a ten hour dance marathon, attended by 6000 people - here's the poster on the right. The emergency services reported an increase in calls to drink-related disturbances, as compared with last year. Greater Manchester Ambulance Service had to deal with 787 calls between midnight and 5am of January the 1st. CONCERTS have included the Halle Viennese Night and the Johann Strauss Gala at the Bridgewater Hall. THE SNOW SLOPE AND ALPINE VILLAGE have been declared an overwhelming success. The imaginitave Christmas attraction, dreamed up by those enterprising people at Manchester City Council, has been used by 15000 visitors in thirteen days. Today I saw workmen taking down the scaffolding and ice-making equipment and packing it away into lorries so, that's it for another year. 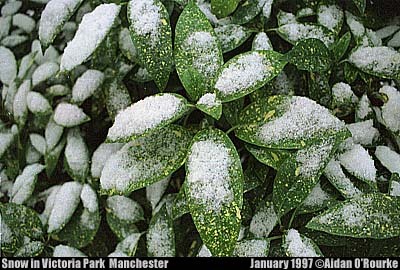 SNOW AFFECTED MANCHESTER on Saturday, though it wasn't falling here, but in Chicago, where there are severe ice storms. Can anyone out there report, maybe with a photo? The weather caused the cancellation of two American Airlines flights between Ringway and O'Hare. I wonder if I'll be able to take a picture like the one below over the next couple of months. I took it exactly two years ago. So far we've had almost no snow at all. It feels strange, disappointing, and worrying. I remember heavy snow in London in winter 82/83. 85 was wintery and snowy too, but nowadays, the climate seems to be unseasonably mild a lot of the time, with clouds and storms. NO, THE WEATHER HASN'T BEEN VERY PLEASANT over the last week or so. After the Boxing Day storms, there's been more rain, and strong winds. There's been intermittent hazy sunshine for some of the time, but mostly there's been cloud and rain. Last night we were on the outer edge of a storm with moderate to high winds - Northern Ireland and Scotland caught the worst of it. Tonight it's eight degrees celsius, forty-three degrees fahrenheit outside with almost no wind. I haven't been out with my camera at all lately due to the lacklustre weather conditions - and I've dug into the archives for some of this week's pictures. 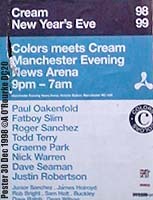 Also I've been working on the new and extended Eyewitness in Manchester for 1999 - ready either next week or the week after.